Do you want great ears? The kind of hearing that allows you to pick out chords, chord-tones, and progressions? Do you wish transcribing were easy and that learning from recordings became your norm because it just made sense? We all know that ear training is essential for any serious musician. But if you’re like most musicians, you still haven’t figured the best way to train your ear and you lack the skill level you wish you had. Perhaps you’ve tried to develop your ear, but weren’t seeing the results you wanted. Or maybe you didn’t know exactly how to practice or where to begin. We’ve all been there and it’s beyond frustrating. It’s time to stop thinking about music and start hearing it once and for all. Don’t spend another practice session struggling in frustration or another performance lost and isolated from your fellow musicians. Learn to connect to the sound of music on a deeper level. With the tools you’ll learn in this course, you can make this a reality. The Ear Training Method is an in-depth ear training course that’s designed to quickly improve your ear so you can start achieving your musical potential. The entire course is self-contained. You don’t need anything, or anyone, to train your ears. Simply Press Play and Improve! 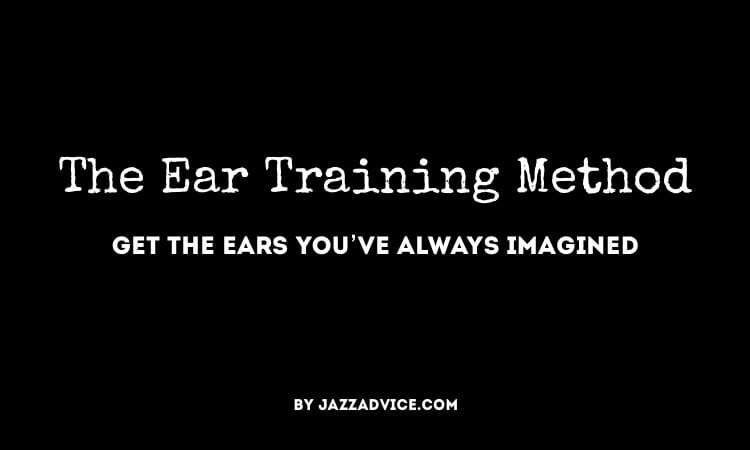 The Ear Training Method makes improving your ears easier than ever before, guiding you the entire way. With over 300 tailor made audio lessons that guide you step by step through the process of training your ear, you’ll be able to improve wherever you are. Because learning to hear shouldn’t be a mystery and it shouldn’t be limited to a classroom or a practice room. Practice on the way to work, test your ears as you lay in bed, and improve your musicianship in your free time. All this ear training work you can do anywhere, any time, making you a better musician and jazz improviser every single day. 90 page “Program Notes” – This is a simple guide to the audio, making sure that you go through the course in the right order and get the most out of it. 300 audio tracks – Ear Traning practice tracks you can take with you anywhere you go. That’s it! Log in, and you’ll have lifetime access to download your course, as well as any online materials or updates. Note that this is a digital course and nothing will be shipped to you. What makes the Ear Training Method so effective? It’s all in the details. We’ve painstakingly crafted each audio lesson in this course to give you the tools you need to rapidly improve your ears. 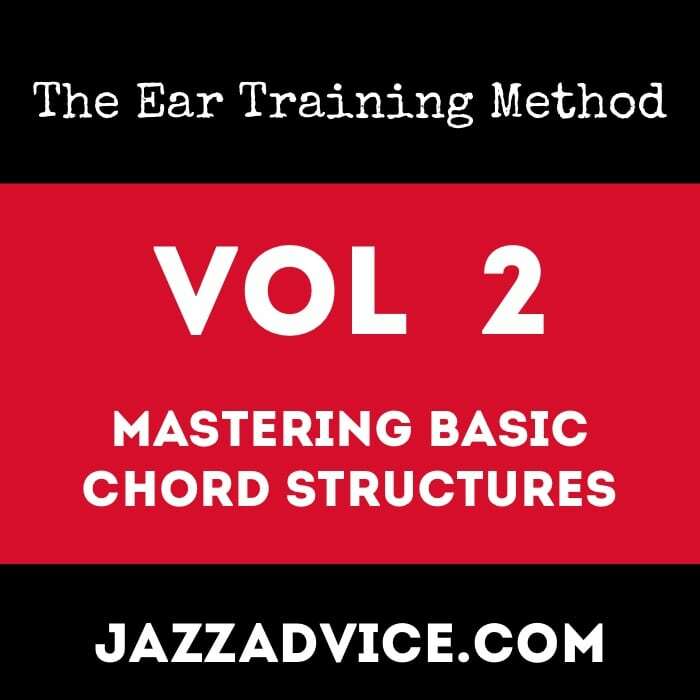 The Ear Training Method uses a unique 3 step system for training your ears that builds a solid foundation up from intervals and triads to 7th chords and complex chord voicings. With this course you’ll develop musical skills for the real world. You can learn music theory from a book, but training your ear requires sound. That’s why with this method you’ll not only learn the information, you’ll hear it, sing it, and be tested on your progress each step of the way. And if you miss something? Simply go back and review the lessons at your own pace. We’ll be there every step of the way, coaching you from the beginning all the way through the end. 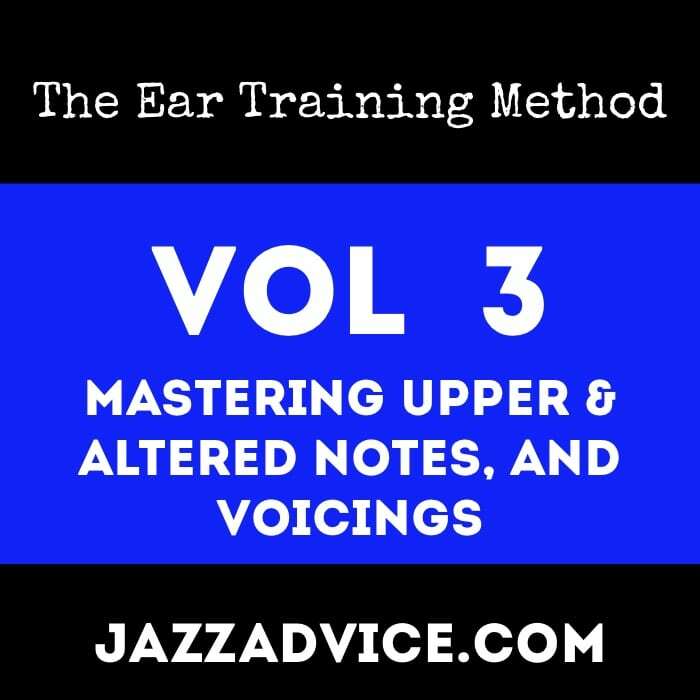 The Ear Training Method is split into 3 comprehensive volumes, with over 300 audio lessons. To see a complete track listing of the course click here. All three volumes are included in your purchase. Intervals are the building blocks for every melody, chord and bass line that you’ll encounter as a musician. From the symphonies of Beethoven to the solos of Miles Davis, intervals are the key ingredient. You’ve probably done some interval ear training before, but in this course, you’ll master them once and for all. 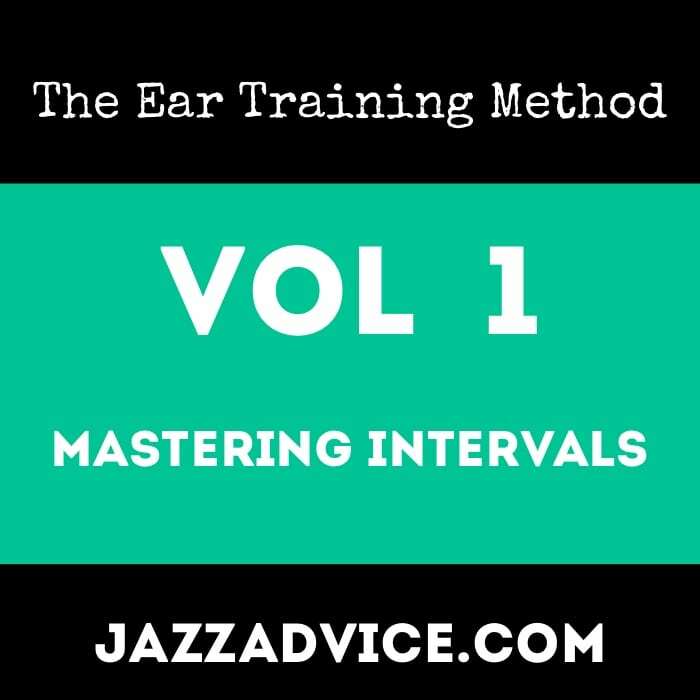 Over the course of twelve expansive lessons containing 120 audio tracks you’ll get to know your intervals on a deeper level than ever before. You’ll get beyond having to think about them, and get to the point where you just know them! And we’ll even take you beyond mastering each individual interval, teaching you to hear as many intervals in a row as you like using the simple yet effective note-pairing technique. Using this one little trick will catapult your ability to hear and sing many intervals in a row. In Volume 2, you’ll finally clear up the confusion surrounding chords. You’ll not only learn to identify the quality of basic chord structures, you’ll truly understand each chord type inside out. You’ll build the necessary foundation needed to hear anything you wish. In Volume 3, you’ll build on what you’ve learned in the previous two volumes, diving into the upper structures of chords, altered notes, and hearing complex chord voicings. All the difficulty surrounding these advanced concepts will be broken down and explained so you finally get a firm aural and conceptual grasp on it. Progressing through these 3 volumes, you’ll stretch your ear more than ever and finally attain the strong foundation needed for jazz musicians. So what makes The Ear Training Method so different and unique? This method uses quite a few unique techniques that set it apart from what you may be used to finding in other courses. You just know who it is. And that’s exactly how it should be for intervals, chords, or anything else you want to hear in music. To become absolutely masterful at anything related to ear training, the ear has to hear the information repeated many times until a “click” moment happens and it learns to recognize that information without a doubt. That’s why we have a concept called “ingrain” which drills whatever it is you’re learning at the time, over and over all over the piano until you can hear it instantly, in all registers, at any speed, with zero effort, just like a friend’s voice. In most ear training courses, they tell you what to do but don’t automate the work for you. They expect you to go off and sit by the piano and play this stuff for hours. What a waste of time! When we built this course, we created it with our commute to work in mind. We wanted to make use of the time we were already wasting. We wanted to be able to just press play on the smart phone and have the information spoon-fed to us. No piano necessary. No two person exercises where we had to depend on a ear training partner. Just us and the tracks. And we wanted each track to naturally build upon the previous track. In this way, we could just listen and absorb, strengthening our ear every single day with minimum effort. That is how The Ear Training Method came about. This course makes you sing everything. With the unique way it’s setup, it cues your singing and checks to make sure you’re singing accurately. Why singing? Because if you can sing it right, then you’re hearing right. It’s like having a private ear training coach that you can access at any time. One of the best ways our ear can learn is through contrast. By using this principle and strategically grouping similar sounds together, we’ve created exercises that teach you how to differentiate between things that are commonly mistaken. No more mixing up a perfect 4th for a 5th, or stressing out between the various dominant alterations. All these little details are sorted out and worked on. This course focuses on the ear training that you actually need to apply in the real-world, and many courses touch in intervals and chords, but there’s more to it than that. And second, you need some information that other ear training just doesn’t cover. You need to hear chord-tone colors and chord voicings. Whether you’re a jazz musician or not, these topics are crucial to how we hear music. Music is organized sound and adding topics like these to your ear training is essential to hearing that organization when it comes to jazz or any more complex music. A: Once you buy the course, you simply log in to your account. Your “Dashboard” gives you easy access to all your courses, downloads, and membership benefits. Q: Is there a discount if I buy all the Courses? A: Yes! If you purchase all four Fundamental Courses together, you can save 10% and get a whole year of premium for $1. Click here for details about this Jazzadvice Course discount. Q: Is The ETM based on intervals or functional/contextual ear training? A: Some people think learning intervals is a waste of time and say to instead focus on the sound of each chord-tone within a key. We’ve found that both skills are necessary and useful skills, not replacements for one another. In The Ear Training Method, you’ll master both interval ear training and functional ear training. And you may find one more beneficial than the other, but in terms of training your ear, they both will be tools in your musical toolbox that help and improve what you can hear and play. Q: How do interval and functional ear training differ and help you? A: Intervals help immensely when learning root motion of a tune and they also provide an alternate perspective to melodic content which helps in playing and composing. That’s right, we don’t want to be limited to a specific role or a certain style of music. Your ear training should make you a better player, performer, and even listener! Chord-tones in context, what many call functional/contextual ear training, are indispensable in terms of melodic improvisation, transcribing, and more. When you learn to hear the “color” of each chord-tone within a given harmonic context, you will hear and play on the next level, allowing you to make melodic and harmonic decisions based upon what you desire to express. Q: What format is the course in? A: Courses are downloadable from your Dashboard in Zip format. The Zip file contains MP3s (audio) and PDF (eBook). Q: Are the audio tracks for playing along with? A: No. The audio tracks in the Ear Training Method help you to practice hear ing the intricate elements of music. Q: Who is this method for? A: We’re not going to lie. This method isn’t for everyone. If you’re looking for a quick short cut, an escape from daily practice, or a way to fake it on stage without building the necessary skills, then you should look elsewhere. The Ear Training Method is for musicians who have a great desire to improve and are serious about spending the necessary time to train their ears from the ground up. This course can be used by people of all levels because it breaks down super complex concepts into little pieces, so even beginners can follow along and build their skills. If you’ve been frustrated with your practice and you want a rapid and methodical way to achieve results, then The Ear Training Method is for you. Q: I’m not a jazz musician. Can I still use this course? A: The Ear Training Method benefits musicians of all styles. The truth is…the ability to hear and identify the elements of music isn’t limited to jazz – it’s an essential skill for anyone practicing or performing music. Whether you’re a performer, a composer, a music teacher, or an aspiring improviser you need to train your ears to perform at your peak. In this method we’ve included exercises that will not only build and reinforce the fundamentals of training your ear, but will push your limits to the advanced harmonies and complex chords structures of modern music. Whichever style of music you play, the bottom line is the same: if you want to reach your potential as a musician, you need to have great ears. Q: Is there a money back guarantee or a refund if I don’t like it? A: No. We do not give refunds or money back guarantees. We’ve spent years developing and refining each course. If you’re lazy or think you know everything already, just don’t buy the course, because it takes a ton of work – a consistent effort, desire, and an open mind. If you genuinely wish to get better and enjoy the process of doing so, then you’ll really enjoy this course and get a lot out of it. It’s simple: if you follow the plan and put in the practice time, you will improve. Q: Is this course easy enough for beginners? A: Yes. The Ear Training Method can be used by musicians of all levels, but it helps if you have some basic chord and improvisational knowledge. If you’re the kind of person that’s willing to google the things they don’t understand, then you’ll be fine. Q: Does Premium come with this Course? A: No. The four Fundamental Courses, including this one, are standalone, completely separate from your premium membership. If you’re interested in purchasing both The Fundamental Courses and Premium, make sure to check out The Courses and Premium Bundle. Q: I’m an intermediate or advanced player. Will this course be good for me? A: Yes. The exercises and knowledge presented in this course is a lifetime of practice. There’s always a higher level to achieve and more complex variations you can create. Being more advanced will allow you to figure out your own ways and exercises to add to your ear training practice. A: You can start with any course and they can all be used at the same time because they compliment each other. For more info, check out our suggested order of study. Q: What instrument(s) is this course for? A: All instruments can use this course. We made this course to give you the necessary fundamentals needed as a jazz musician. If you have any questions at all about the course, we’re more than happy to answer them.